Like a million people out in the real world, I do not understand how strokes work in Inkscape, and do not have the time or dedication allotment to really learn. This is not what I wanted. I wanted a stroke with equal width throughout, just like the way that is default in many other vector graphics editing programs like Adobe Illustrator or CorelDRAW. I have thankfully found out how to switch off this functionality in this question. But I sometimes forget to switch it off, and get these kind of unwanted results. How can I reset the width of stroke to an equal value along a path? What probably happened is you had a shape selected when using the Drawing tool. When you select the drawing tool, there is some context-sensitive options at the top, and one of them is shape. What this feature really does is apply a filter to your path (it also may swap fill and stroke). You can remove it by clicking Path → Remove Path Effect. If the result fills in the blank space in the shape, open Fill and Stroke Ctrl+Shift+F and make sure that fill is set to none and the stroke paint is set correctly. If you ever see something in Inkscape and you can’t figure out why it’s being rendered that way, select the object and inspect the SVG by opening up the XML editor Ctrl+Shift+X. Often you can diagnose something by looking at its attributes. In this case, you can see that inkscape:path-effect is set, which means a path effect was applied. I solved it using Scribblemacher's bonus tip! 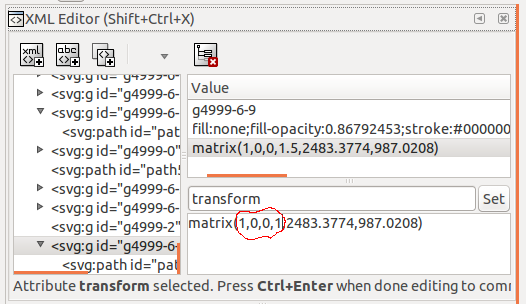 You just need to go to the XML editor of that shape (select it and press Ctrl+Shift+X), then select the last item in the Value box (the one begins with "matrix") and set the first 4 numbers to 1,0,0,1 and press Set.